On the first day of Operation Citadel, 3rd Panzer Division expected to push through the Soviet Guards in front of them and exploit northward to the second defensive belt. Unfortunately they held low priority for replacements which made their task tougher than it should have been. Only 21 long-barreled Panzer IV’s showed in inventory, although their panzer grenadier and artillery establishments appeared to be up to strength. Often inferior equipment can be overcome by highly-trained men executing the proper tactical doctrine. That happened in this battle when the Germans routed the battle-hardened Guards. Securing Korovino proved a challenge, but the grenadiers persevered and lurched forward in the pursuit to take Krasnyi Pochinok as icing on the cake. This is a big scenario, with a German mixed force of tanks and infantry backed by ample air and artillery support assaulting a thoroughly entrenched Soviet position just bristling with powerful anti-tank guns and defended by high-morale troops. This is going to be a very bloody affair. The main thrust of XXXXVIII Panzer Corps aimed at Cherkasskoye, led by the Grossdeutschland Panzer Grenadier Division. The corps assigned the 11th Panzer Division to advance northward along their right flank providing support. At best the 11th Panzer would draw enemy reinforcements away from Cherkasskoye, and at worst protect the Grossdeutschland’s flank. According to a Grossdeutschland artillery lieutenant: "11th Panzer Division has made better progress than we. Quite contrary to expectations!” That snide comment was either ignorant or unfair, or possibly both; 11th Panzer had proven itself to be a fine fighting formation during the failed attempt to relieve Stalingrad in the previous winter. At Kursk the division showed this to be no fluke. After breaking though the first defensive belt the 11th Panzer Division wheeled around to take Cherkasskoye from the east. The Germans are trying to advance on a narrow front with a powerful, high-morale balanced force of tanks and infantry. The Soviets are thick on the ground, with plenty of entrenchments and anti-tank guns. The mud is even thicker, and the Germans have to achieve a lot in order to win – this is not going to be easy for either side. XLVIII Panzer Corps brought the Grossdeutschland Panzer Grenadier Division up to full strength to spearhead the drive north, and through adept political maneuvering attached the entire 200 Panthers of 10th Panzer Brigade to the division. Originally half were destined for the II SS Panzer Corps. Concentrating all of their massive firepower on a small front made the corps and Grossdeutschland staffs confident of quickly brushing aside enemy resistance and securing Cherkasskoye early enough to continue the advance. The Grossdeutschland commanders found out that too many men and machines jammed into a small area just adds to the casualties against stubborn defenders. The troops couldn’t get out of their own way until the 11th Panzer Division, diverted to Cherkasskoye, distracted the Soviets enough for the grenadiers and their panzers to ease forward. The much-ballyhooed debut of the Panther tank was an unmitigated disaster. The Army mishandled it from the beginning by assigning green personnel to the unit instead of veteran tankers who would have recognized and worked through most of the mechanical and unique operating challenges. The lack of large-scale training meant that the unit promptly drove nose-to-tail into a muddy ravine and became stuck. Both the tankers and engineers trying to free them suffered serious casualties before they freed the Panthers. The only bright spot came when the panzers claimed eight Grant tanks destroyed. Tigers and Panthers and even more other Germans tanks come swarming at a well-fortified Soviet position manned by Soviet Guards. It’s another tough fight with the Germans yet again facing tough victory conditions but lots of troops and tanks with which to achieve them. XLVIII Panzer Corps ordered 3rd Panzer Division to find a crossing over the Pena River near Rakovo. The plan called for an early morning assault, but it depended on the defeat of the remaining defenders around Cherkasskoye. Shortly after 1000 they received the "go" order. The panzers brushed aside the Guards defenders and pushed on to the river. There the recon battalion vainly searched for a crossing suitable for armor over the steeply banked though shallow river, all the while taking heavy fire from the north bank. Between counterattacks and a lack of suitable crossing sites the XLVIII Corps soon turned their attention to the northeast. This time it’s a lightly-armored German tank-infantry force, with a lot of recon vehicles and every foot unit riding in an armored personnel carrier. The Soviets are on foot but well dug-in; they’re not going to keep up with the Germans but it doesn’t matter, since the Germans have to come to them. Pressing for more progress, corps headquarters ordered 11th Panzer to continue their northward advance at first light. Air support had been missing in action on the previous day as the planes were diverted to aid the politically-better-connected II SS Panzer Corps. With no German aircraft to threaten them, long-range Soviet artillery batteries rained shells down on the division’s rear-area services. Eleventh Panzer’s combat elements moved out anyway to face the same Guards they’d driven out of Cherkasskoye the day before, hoping for better support. The Germans drove through the defenders once again and reached the Lukhanino River. When 3rd Panzer Division reported the lack of a suitable crossing over the Pena River, the corps staff shifted their axis of advance to the northeast. A failed attempt to secure Dubrova marked the end of active operations for the day. The Soviets are no longer so well-dug-in, as the Germans have fought their way through the first lines of fortifications. But the Germans have paid a price for that success, and they no longer are quite as awesome as when they started out. Even so, they have to keep advancing if they want to win the game. At first light Grossdeutschland moved forward to wrestle Alekseevka and Lukhanino from the Soviet defenders. Thanks to the poor performance of 10th Panzer Brigade on the previous day, they were placed directly under the command of Grossdeutschland despite the brigade commander’s protest. Grossdeutschland’s reconnaissance and assault gun battalions sat in reserve waiting to exploit any opportunities. According to one participant in the “ferocious” fighting, the Soviets held firm, rebuffing eight German assaults on Alekseevka and Lukhanino. As a result of this resistance, the panzer regiment slid east towards Dubrova where they mounted another unsuccessful attack. The only German triumph of the day came when the recon battalion infiltrated the Soviet lines and created a small bridgehead over the Pena River. The stubborn Soviets probably would have prevented even this small victory had the 3rd Mechanized Corps' two tank brigades been present rather than detached elsewhere for the day. Unlike the easy German successes of years past, today a single Red Army mechanized corps met the mechanized might of the Wehrmacht and prevailed. The Soviet leaders believed they were on the right track with their new tanks and mechanized organizations. History would prove them right. Tank battle! The Germans have their best division on the attack, with huge numbers of tanks on hand including Panthers and Tigers. But this time the Soviet line has armor support of its own to go with the entrenchments and anti-tank guns. The Germans are going to need all of their firepower and morale to achieve another very tough set of victory conditions. With Operation Citadel already seriously behind schedule, the Grossdeutschland division commander, Generalmajor Walter Hörnlein, knew they had to break through the second defensive belt today. Before dawn the engines of the panzers came alive and the grenadiers made ready for combat. Task number one for of the panzer grenadier regiment: secure Dubrova, which withstood their best efforts yesterday. After that, seize Sirtsev. The fully-deployed panzer regiment rumbled into a minefield thus stopping all forward progress for a time. Once extracted, enemy armor appeared creating new difficulties. Nonetheless, they eventually cleared Sirtsev securing the right flank, but a determined stand by the newly-arrived Soviet 112th Tank Brigade on Hill 230.1 took a while to deal with. A mistaken report that Verkhopenie had fallen to the Fusilier Regiment brought short-lived elation in division headquarters, but they soon realized the fusiliers had captured Gremuchii instead. In the vast, poorly-mapped expanses of Russia this occurred with annoying frequency. Alternate orders began to issue across the radio. The Soviet fortifications are getting thinner, but their tanks are starting to appear in numbers on the battlefield to bolster the defense – this time in equal numbers to the Germans. Another furious battle, with the Germans forced to keeping coming against a powerful defender. Despite their grudging progress, the last three days ground down the proud Grossdeutschland Division as they had suffered horrendous casualties and fallen far behind schedule. The plan called for them to be breaching the third defensive belt today, while instead they struggled, still entangled in the second. Soviet reinforcements raced to fill the ranks of the fallen and plug gaps as they opened. The Germans needed to make the breakthrough soon or it would not come at all. Before the Germans commenced their own attack, four burning panzers announced a preemptive Soviet attack. Grossdeutschland rallied, then turned the tables on the ambitious attackers, driving them back through Sirtsev from which they arrived. The Assault Gun Battalion drove off strong enemy counterattacks around Gremuchii, destroying 35 enemy tanks in the process. The force driving on Verkhopenie, despite taking a mauling from enemy armor on Hill 243, pushed on and eventually wedged itself into the eastern portion of Verkhopenie. I somehow let one of Mike Perryman’s bad 70’s song titles through as a scenario title again. Once again, the best German division is on the attack against a furiously determined defense backed by tanks and still more tanks. Thanks to a weak start, Grossdeutschland faced a long list of objectives by the offensive’s fifth day. They needed to drive the remaining enemy from Verkhopenie and then subdue Novoselovka. Plans called for the recon battalion to clear Hill 260.8 and dig in in order to isolate the Soviets in Verkhopenie before the main force struck them. The recon men did their job, enabling the last houses of Verkhopenie to be cleared by 0900. This freed the panzers to move swiftly northward, leapfrogging the recon battle group. Foregoing good sense the Soviet 86th Tank Brigade charged forward against the longer-ranged German tanks in open terrain where they didn’t stand a chance. For days the Soviets thwarted all German efforts to secure Berezovka or drive them from the large horseshoe bend of the Pena River. Eventually corps headquarters understood that 3rd Panzer Division lacked the strength to finish the job, so they ordered up Grossdeutschland to join them in eliminating the problem area once and for all. XLVII Panzer Corps had identified the boundary between the Soviet 6th Tank and 3rd Mechanized Corps the night before. This knowledge allowed the recon battalion to isolate the 200th Tank Brigade, which the main body of Grossdeutschland then quickly overran. The Soviet commander, General A.L. Getman, responded poorly by sending the rest of his 6th Tank Corps into the battle in piecemeal fashion. The Germans responded in turn by pocketing and virtually destroying the Soviet armor at little cost to themselves. Hill 247 fell to the Germans but the village of Kruglik remained in Soviet hands. Stalin Organs firing their rockets off special ramps (common at Kursk) used direct fire against the advancing assault guns around Kruglik. Besides tearing up the countryside, one hit set off a smoke candle, bathing the field in a grey cloud but causing no other damage. A little different, as the Germans have a small flanking force coming from the south and a powerful one from the east against a Soviet line that’s probably bent to refuse its left flank (you don’t have to set up that way, but it’s probably a good idea to do so). That makes for a long line to defend, so the Soviets are going to need their armor reinforcements to help plug any holes that open up in it. 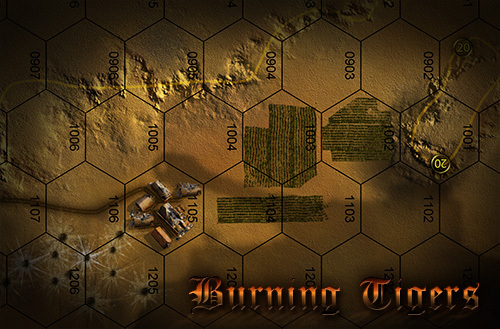 And that wraps our scenario preview for Kursk: Burning Tigers. Click on that link down below, and start playing them for yourself. Click here to order Burning Tigers right now!